Rookie QB Baker Mayfield did a tremendous job following the early departure of Tyrod Taylor. He orchestrated the late second quarter drive that put the first three points on the board and led scoring drives both ending in Carlos Hyde touchdowns. To top it all off, he collected a two-point conversion following their third-quarter score on a trick pass from Jarvis Landry. Mayfield may have found playing time due to an injury but this performance should clear away a path to securing the starting job, moving forward. Making fantasy owners happy across the nation, Landry’s involvement increased exponentially with Mayfield under center, and ended up eclipsing 100 receiving yards on 15 targets. The Browns came into the game coming off two defensive performances that arguably should have netted two wins. The young core of the defense all played well, led by Denzel Ward stripping Robby Anderson and Myles Garrett sacking Sam Darnold twice as well as adding on a batted pass. 2017 Pro Bowl LB Joe Schobert picked off Darnold on the penultimate drive while Terrance Mitchell sealed the game with an interception on the final drive. We at PFF have spoken at great length this past offseason on the importance of defending the pass and how defending the run isn’t quite as important. The Browns defense were a historically great (in terms of yards per rush allowed) run defense in 2017 and lost every game. 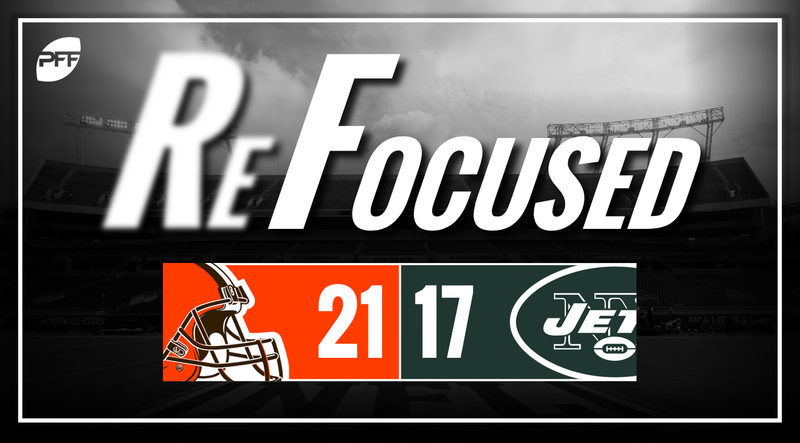 Against the Jets, they gave up two touchdowns and many chunk plays but it didn’t matter in the end as the Browns coverage on the back end was excellent holding Darnold 5.5 yards per attempt and forcing several incomplete passes. Rookie QB Sam Darnold struggled, to say the least, against Gregg Williams and the exotic and aggressive Browns defense. When Darnold wasn’t throwing a screen, he struggled to complete passes as he seemingly couldn’t find a rhythm all game long. Left tackle Kelvin Beachum is not a household name by any stretch of the imagination but he held his own against Garrett when facing him. This was a good test for Beachum and while the Jets did him favors with double teams, chips, screens and bootlegs, Beachum did well and that bodes well for the development of his rookie signal-caller. The Jets’ defense started out very strong, moving Taylor from his spot throughout his time on the field. No doubt the secondary benefited from the myriad of off-target throws from Taylor but, of course, that is all put out of memory after permitting the Browns to secure their first win in a stretch of nearly two years. Darron Lee continued his aggressive, impressive play, and Avery Williamson was all over the field while collecting multiple tackles and a pair of sacks. Cleveland: Mayfield put on a show passing into tight windows, dropping deep targets into the appropriate hands and showing plus mobility to avoid pressure. The season long outlook for Cleveland is headed in a very positive direction. New York: The Browns defense gave Darnold fits all night as he couldn’t find many open receivers and eventually started forcing throws which resulted in interceptions.